With the competition reaching the quarter-final stage this weekend, the remaining eight teams left in the FA Cup are just 90 minutes from a trip to the home of football. The sixth round of the competition sees the teams compete for the honour of playing in a Wembley semi-final, with the top three divisions in English football all still represented. Bradford City remain the lowest-ranking team in the competition having overcome Premier League opponents Sunderland and Chelsea in the two previous rounds. Their reward is a home tie at Valley Parade against Steve Clarke’s Reading of the Championship, who beat both Derby and Cardiff on their travels to reach this stage. 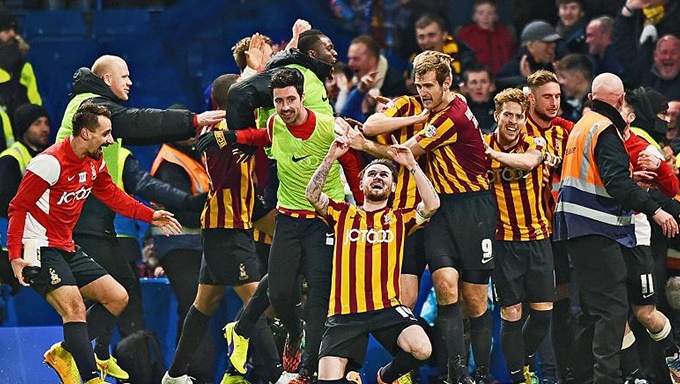 Bantams fans will be hoping their side can return to the national stadium for the second time in three seasons, following their remarkable run to the League Cup final in 2012/13. Phil Parkinson’s side are available at 13/8 with Coral Sports to complete the feat in the Saturday lunchtime fixture, with Reading a respectable 15/8 with Betfred Sports to secure their third successive win away from home in the cup. An all-EPL West Midlands derby sees Aston Villa take on West Brom for the second time in a week. Tim Sherwood’s men have the psychological advantage after Christian Benteke’s 94th-minute penalty gave Villa a 2-1 victory over Tony Pulis’ men on Tuesday night. After a closely fought contest at Villa Park, a draw at 11/5 is perhaps the safest option for Saturday evening. The only other non-Premier League side remaining are Blackburn Rovers, who travel to an in-form Liverpool side having emphatically seen off top flight clubs Stoke and Swansea in the previous rounds. The last time Rovers won at Anfield was in the 1999/2000 FA Cup 4th round – and Gary Bowyer’s men are a lengthy 10/1 with Winner Sports to do so again. Brendan Rodgers’ rampant Reds are 4/11 with Betfred Sports to stay on course to add to the club’s seven FA Cups, with in-form midfielder Phillippe Coutinho 13/2 with 888 Sports to score first on Sunday. Manchester United and Arsenal complete the line-up as they meet at Old Trafford on Monday night. Their previous two meetings in the FA Cup saw Alex Ferguson’s side take the spoils on home soil with 2-0 and 4-0 scorelines. United are 11/8 to repeat the trick under Louis van Gaal’s stewardship, while the Gunners are 9/4 with Coral Sports to replicate their win from back in 2003. Wayne Rooney has 13 goals against Arsene Wenger’s men in all competitions and is 11/2 with Bet365 Sports to score first. For more FA Cup odds visit Bet365 Sports today.